The Drive: I don’t know about you, but driving always piques my imagination. On the way to the beach, our last stretch was the farm country of Delaware and Maryland. Beautiful small farms, dotted with rustic stands selling fresh produce… Hmmmm. What if a city hero or heroine inherited a farm? Or, even better, what if a handsome-but-struggling farmer found out that his high school ex was moving back home, and that his interfering mom gave her a job running their family farm stand? Morning inspiration: Each day I get up way before the nocturnal teenagers. A little coffee, and to work. 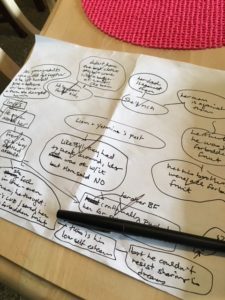 My new surroundings help me work out a thorny bit of backstory via a mind map. Even more important, distance from home gives me perspective on the bleeding-red-ink proposal that came back from my editor last week. Now, in the presence of beautiful sunsets and a big, big ocean, I realize that I don’t need to take the criticism personally. Of course, the suggested revisions will make my book much stronger. toward consoling the teenagers about the rain that is thwarting their tanning plans. 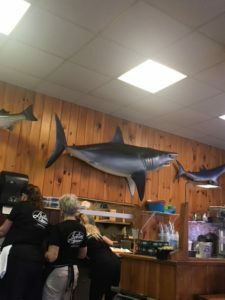 Plus, bonus: I often include diners in my books, so I welcome the chance to visit a new one that’s full of character. This one has fish on the walls and a couple of waitresses who spontaneously start waltzing back by the kitchen. That’ll show up in a book! Reading! At home, I get so caught up in work and home chores that I don’t read nearly as much as I want to. Here at the beach, I’ve got two books going at once and am making great progress through both of them. Beach reads are a real thing! Hi Lee! Glad to hear you are enjoying your vacation and getting some reading done. As a retirees, who have traveled coast to coast but now have a 16 year old deaf anxiety ridden Sheltie, our vacations are day road trips. A good day trip is exploring road we do not normally travel and find a restaurant we have never visited. What a way to explore Michigan and Indiana. The contrast in small communities is eye opening. 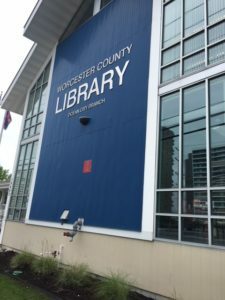 SW Michigan communities are blessed with great local libraries, independent book stores, abundance of farm stands, beaches, vineyards, and lots of local color. Happy writing. Thanks for jumping in with the first comment, Renate! I love day trips, too. It can be just as much fun, and a lot easier and cheaper, to hop in the car and drive a couple of hours to a new town or lunch spot. We live near Amish country, which always makes for a fun visit. We do too. Always enjoy having lunch at the Dutchman Essenhouse in Middkebury, Indiana. They have unique shops. Hi Lee, sounds like the beach is a winner- hope you get some rain free, sunny days:) It is winter here, so the beach is not high on our holiday plans!! My in-laws are coming over so we will do day trips with them. If there is good snow cover- then definitely a day cross country skiing. That’s wonderful that you go cross country skiing… great exercise! I should take it up again. I need something to get me outdoors in winter, as I become pretty lazy then! Hi Lee, very interesting post! Hope your vacay goes well! I am reading your Rescue River series (on 4 now). I have collected all of them and am loving reading them. I love the inspirational thread, and also, you are just fantastic in writing about relationships. Everything you touch on seems to be going on in my life at this time. THANKS for writing this series. I hope I can find The Soldier’s Redemption when I go to Walmart this week! With health issues, that is about all the traveling we do nowadays! Thank you so much for the compliment… I am so glad you’re finding the books relevant! Hey Lee, our vacations usually end up in a book too. My husband can always tell when inspiration strikes me. He says I’m there with him (physically), but I’m not really there (mentally). Sounds like a great vacation and a great book. So true! 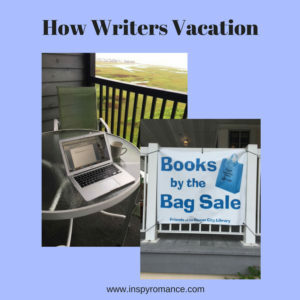 Writerly vacations can take you out of the moment at times. I would definitely end up with a bag of books at a library sale. We’ve been enjoying going to the local pool and water park with our daughter and grandkids. Season passes were on sale really inexpensively and my husband as a vet gets in free. I’m thankful for that. Simple pleasures can be the best… enjoy the sunshine and family time! Enjoy your vacation! 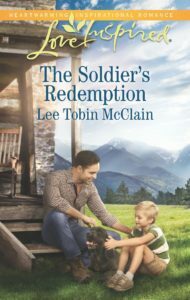 As the mother of a soldier suffering from severe PTSD, I am enjoying your Redemption Ranch series. I can really relate to the struggles of the characters. It is heartbreaking what they go through, and affects the entire family. I also, love the beach, going to different libraries around the county, and reading. As of right now, I have no vacation plans.